An immigrant arrested after delivering pizza to an Army base, and later ordered released, has been arrested again. Greg Cergol reports. The Ecuadorean immigrant who was held for deportation after he delivered pizza to a Brooklyn Army installation, before a judge ordered his immediate release last July, has been arrested after allegedly assaulting his wife and keeping her from calling police. 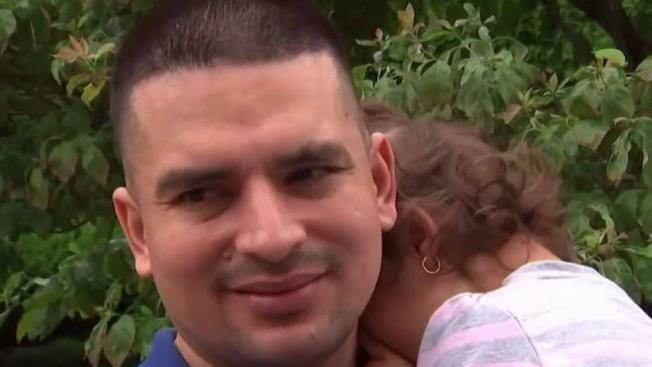 But he walked out of an immigration detention center in New Jersey last July and was greeted with hugs from his jubilant wife and two young daughters. Hours earlier, U.S. District Judge Paul Crotty wrote of Villavicencio, "Although he stayed in the United States unlawfully and is currently subject to a final order of removal, he has otherwise been a model citizen." The judge said Villavicencio could remain in the United States while he exhausted his right to try to gain legal status. Villavicencio applied to stay in the U.S. after he married a U.S. citizen, with whom he has two young girls, ages 2 and 4. The judge ruled after putting a government lawyer on the spot over the effort by immigration authorities to enforce a 2010 deportation order. He questioned the need to detain and quickly deport the 35-year-old Villavicencio. The case attracted widespread attention amid a crackdown by the administration of President Donald Trump on illegal immigration. Trump, a Republican, has said his policies are designed to keep the country safe. New York Gov. Andrew Cuomo, a Democrat, said at the time that the federal government had "cruelly" kept Villavicencio from his wife, Sandra Chica, and two daughters "for no legitimate reason."